The 20-hour bus from Lima to Cuzco (via Nazca) felt like being in the bowels of a ship on a dyspeptic sea. Settlements were few and far between, so no light shone through the bus windows and it felt as if you were being rocking on the ocean because you couldn’t count to “three” before the bus would be turning either left or right. I’d heard that the Lima-Arequipa-Cuzco bus was more comfortable; now I know why. This journey is not for the motion sick. In the end, though, I got what I wanted: a night’s accommodation while traveling and a view of the countryside. What a countryside it is. The road makes impossible hairpin turns every hundred feet and it climbs steeper and for longer than any road I’ve been on. Whenever I was awake, the bus was pitched to the left and right (because of turns) or forward and back (because of hills). The grade would change so quickly that every time I opened my water bottle, it had either expanded or shrunk. You can see why most early travelers between Lima (the main Spanish garrison) and Cuzco (the Incan capital) would have gone further south to avoid these mountains. Without dynamite carved roads, crossing these mountains would have meant climbing straight up. It’s not all steep and rocky, though. On the plateaus, clay brick villages pop up from time to time. Everyone here seems to be a farmer. Things do have a familiar feel. Just like in villages in Vietnam, Cambodia, and China, kids in uniforms run along the winding hill roads, book bags in hand. What will they learn in school? After they’ve finished their lessons, will they want to stay or move on, away from the farms and their one, winding, paved road? Eventually we hit Cuzco. I felt none of the ills of altitude sickness and decided to walk my pack from the bus station 1 km up the hill to my chosen hostel. As is it is when you travel alone, I ended up going to dinner with a couple of girls and a guy who met in Bolivia who’d decided to stick together for a bit. Anyone who’s lonely on the road isn’t really trying to meet people. Travel the well-worn paths, even for a short bit, and you’ll make some friends. My arrogance in the face of 10,860 feet (compared to Denver’s 5,180 feet) is short lived. In the middle of the night I wake up with my chest feeling tight. I down a liter of water and the constriction subsides. (Kids, let that be a lesson to you: when you’re at altitude, pound that water.) Strange that it took almost 12 hours to set in. GALLERY: No bonus pics today. It’s still mostly just a transit day. Tomorrow, exploration starts in earnest. I’m so green!! I do love Cuzco. LOTS to see in the surroundings – Sacsayhuaman is incredible. Do everything possible to stay overnight at/near Machu Picchu so you can be on site before and after the crowds…a magical place. I did spend a night at Aguas Calientes the night before Machu Picchu. Entry is forthcoming. Haven’t had the pleasure of chunos. I’ll check it out. Cuzco is fantastic. Going to be here a while so I should be able to take in most of the sites. Today, though, is Spanish language day. Gonna hire me a tutor. Yeah…I was both motion sick and had altitude sickness on this trip up. It was really bad-I threw up on the bus! Since we could do it, we ended up flying back so I wouldn’t have to try to deal with those crazy, winding roads again. Trey on the other hand is invincible. Altitude sickness hits everyone different. I just had a headache, was a bit dehydrated, and needed to rest frequently on the way up to Saqsaywaman. Otherwise, by the third day, I was fine. For those planning a trip – you can go to Arequipa, which is well worth seeing in its own right as it’s in one of the most beautiful settings I’ve ever seen, and I still remember the deep-fried potato balls in the market, and the nun’s cloister is fascinating, etc. 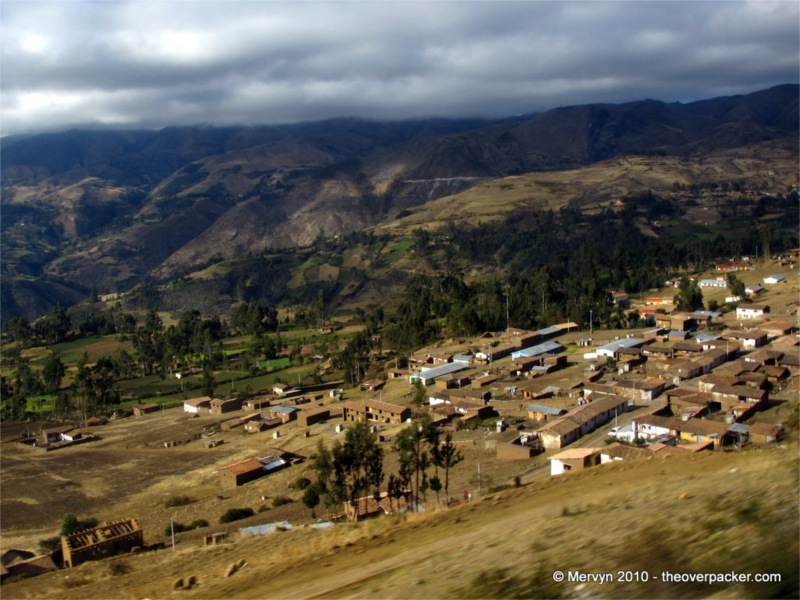 From there, take the train up the mountain to Puno – a WONDERFUL trip. If it’s still overnight, be sure to take warm clothing and blankets. Thanks for the suggestion. I’m considering staying in Arequipa for a day. I’ll look into the train to Puno. If it’s cheaper than a bus, I’m all in. Do it even if it’s not TOO much more money. Trains are better than buses!! Are you planning to go to the floating islands on Titicaca? Worth it, in my opinion, even if you’ve never heard about them in Sabbath School. If you go, buy a variety of fruits in the market and take them out to give away – MUCH appreciated by the locals. In the ’70s, you could ride the train from Cuzco to Puno, and then down to Arequipa. We did it the other direction (the effluvia of the bathroom cars frozen in huge lumps to the undercarriage in the morning), and then went back to Puno and took the old steamer across the lake to Bolivia…it was taken out of service some time back, and I don’t know if it will ever return. Wonderful historical experience to ride on that steamboat – they made it in England, steamed it around the Horn, took it apart on the coast, and hauled the pieces up the mountain to reassemble it on the lakeshore. Had a wonderful bath in a giant clawfoot tub with unlimited hot water!! English porcelain and flatware on the supper table, etc….. Like a dream. I am planning on going to the floating islands. The Lake Titicaca portion of my trip is budgeted for only 2 days. When I get to Lima I’ll do more research on my actual itinerary. I much prefer trains, but it all comes down to expense. Of course, after the ghastly 18 hour journey I had yesterday, I may just cough up the extra dough to travel a less windy road. I have a feeling that no matter what, I won’t be able to afford the steamboat experience. The perils of being a budget traveler. Money is almost always an issue…for those of us who are “real”, anyhow. 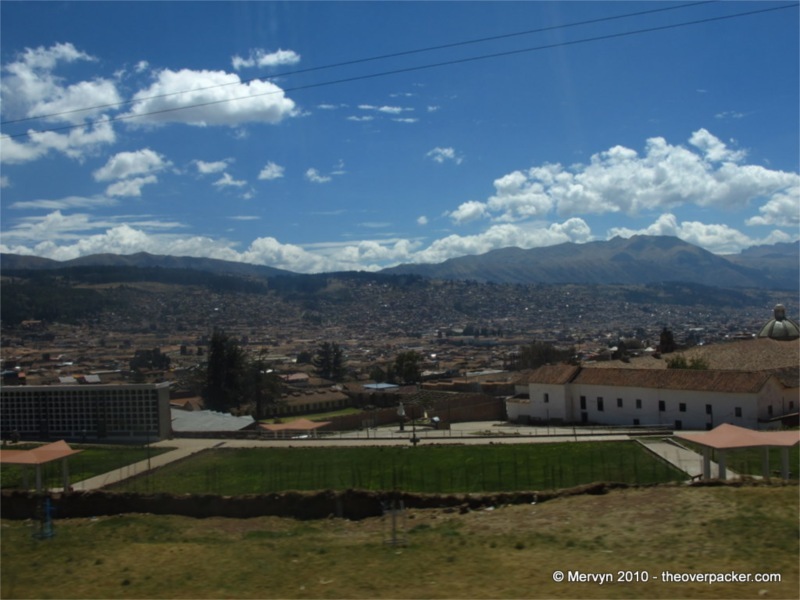 Sadly, the trains are often more expensive than buses (retch) – although if the Puno-Arequipa train isn’t for tourists, it might still be affordable. Buses were very difficult for me in many cases – I’m six feet tall and in some my legs simply would not fit in between my seat and the one ahead of me. In other buses, I could stand in the aisle and press my shoulders against the ceiling to brace myself! In the ’80s (I think), the steamboats were taken out of service on Titicaca, leaving only the hydrofoils….I don’t know the situation now. 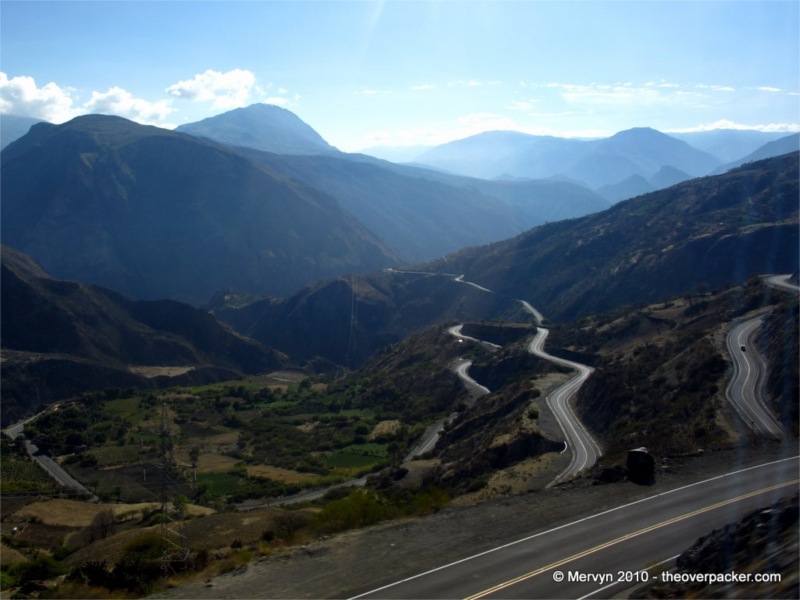 The first time we were there, we took a porpuesto from La Paz to Puno – five years later, we went the other way on the steamboat….like living a piece of history. No height issues here. I’m just about at the height limits here, so I just barely fit. If you haven’t already, I recommend submitting that picture of the road to Top Gear! They always are hunting for the ‘perfect road’ and end up finding them in the middle of Europe. Imagine opening up a sports car on that. mmmm, little tinglies…. I have a feeling this road wouldn’t qualify because it’s actually being used by locals. The roads they’ve featured in the past seem to be governmental boondoggle projects that are barely used. If the Top Gear boys were to tear around those corners in Ferraris or Lambos, they’d probably only make it 3 corners before they were creamed by a public bus. If, however, the roads could be cleared. . .wow. It would be awesome.